Blockchain technology will make its debut in supply chain management next year. The project will develop an enterprise grade, open source distributed ledger framework and free developers to focus on building robust, industry-specific applications, platforms and hardware systems to support business transactions. Many of the founding members are already investing considerable research and development efforts exploring blockchain applications for industry….Blockchain is a digital technology for recording and verifying transactions. The distributed ledger is a permanent, secure tool that makes it easier to create cost-efficient business networks without requiring a centralized point of control. With distributed ledgers, virtually anything of value can be tracked and traded. The application of this emerging technology is showing great promise in the enterprise. For example, it allows securities to be settled in minutes instead of days. It can be used to help companies manage the flow of goods and related payments or enable manufacturers to share production logs with OEMs and regulators to reduce product recalls. In retrospect, this should have been the first prediction I put on my list considering I first made it almost eleven months ago in Bitcoin: A New Supply Chain Operating System? — which, as it turns out, was the most popular Talking Logistics post of 2015! Imagine a bitcoin being a unit of inventory and a digital wallet (“bitcoin address”) being an inventory-keeping location, such as a store, distribution center, or truck trailer. A supply chain blockchain application, therefore, could be used to record the balances and transfers of inventory across a distributed supply chain network. Or imagine a bitcoin being a pallet, tote, keg, barrel, trailer, railcar, ocean container, or other conveyance or asset. An asset owner could use a blockchain application to track the quantity and transfer of assets as they move between supply chain nodes. Of course, bitcoin as it exists today also has the potential to transform freight audit and payment and other supply chain finance processes, especially for small suppliers and transportation providers. Although the technical details are beyond my realm of expertise, if my interpretation of what a blockchain is and does is correct, then I believe we are indeed in the early stages of a new computing era. The groundwork for using blockchain technology in supply chain management has already begun. For example, check out the startup UbiMS, which is using blockchain technology “to change the way businesses manage data, adapt to shifting consumer demands, and coordinate the flow of goods around the globe 24.7.365.” I was briefed by UbiMS earlier this year and I was impressed by the company’s vision and direction. Like me, they see blockchain’s potential to become a new operating system for Supply Chain Operating Networks, and also help to federate those networks. 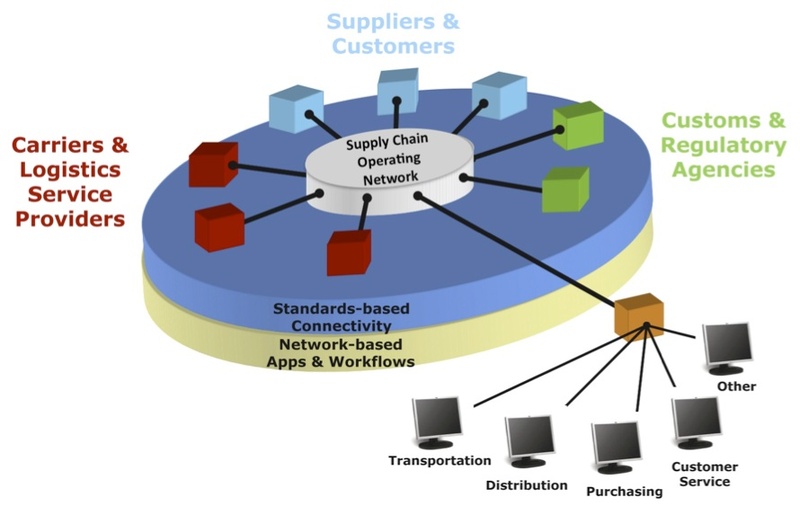 Will blockchain become a new operating system for Supply Chain Operating Networks? Like I said last week, making supply chain and logistics predictions is like throwing darts at a moving target: sometimes you get lucky and hit the mark and other times you miss the bullseye by a mile. Will this prediction about blockchain technology making its debut in supply chain management next year hit the mark or miss the target by a mile? Time will tell, of course, but what do you think? Post a comment and share your thoughts on this prediction!